This colour multifunction device is convenient for small offices that are looking to boost their productivity. The Canon i-SENSYS MF-8540CDN laser multifunction printer is compact, network-ready, and easy-to-use with direct print capabilities, Google Cloud and AirPrint support, and an auto duplexer, but some features are limited and some important functions are missing. This 31Kg device measures 479mm tall, 484mm deep, and 430mm wide with the trays extended, and the i-SENSYS MF8540CDN printer runs on 512MB of shared memory. On-board operation is easier because of the seven-line colour backlit LCD, while connectivity options are Ethernet and high-speed USB 2.0. The flatbed scanner has a 50-sheet DADF, while the input features include a 50-sheet multipurpose tray and a 250-sheet cassette. The output bin can handle 250 sheets. The all-in-one Canon i-SENSYS MF 8540CDN printer scans, copies, and prints. The print speed is up to 20 pages per minute in colour and monochrome. One-touch operational keys for scanning, secure print, and eco-copy are available. 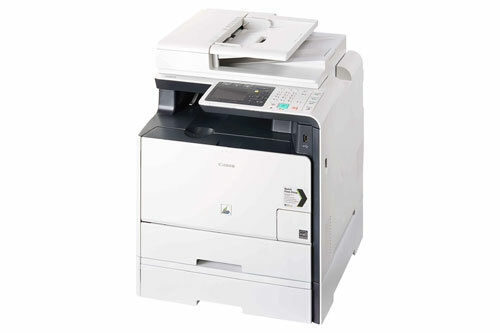 The Canon i-SENSYS MF-8540CDN colour laser printer is an energy-efficient device that warms up fast and supports direct printing from tablets and smart phones. The Canon i-SENSYS MF-8540CDN colour multifunction printer can scan over a network and the automatic document feeder allows users to save time. It is possible to scan directly to a USB key, email, or folder. Third-party manufacturers make compatible Canon MF-8540CDN toner cartridges which are cheaper than Canon's cartridges and help to reduce running costs. There is no fax machine. The Canon MF-8540CDN MFP produces mediocre colour and monochrome documents because of the limited 600x600dpi resolution. There are no additional options to expand the input and output capacity of the i-SENSYS MF8540CDN colour laser printer. The memory of the MF-8540CDN colour printer cannot be expanded.